At present there is no market for expanding South Australia’s uranium mining and exports. In 2012, BHP Billiton put on hold its expansion plan for the Olympic Dam uranium-copper mine and since then has shed hundreds of jobs. That there is an excess of uranium enrichment capacity in the world is even acknowledged by the World Nuclear Association. And, as explained below, wind energy is already much less expensive than nuclear and, on current trends, large solar power stations based on photovoltaic modules will also be cheaper within the 15-year period that it would take to plan and build a nuclear power station in Australia. We should add to the 15 years the indefinite time-period it would take to gain public acceptance. Nuclear energy has allegedly no or low greenhouse gas emissions. New nuclear reactor technologies are allegedly safer than the present generation of reactors. New and existing reactors are allegedly cheaper than other low-carbon technologies, notably renewable energy. 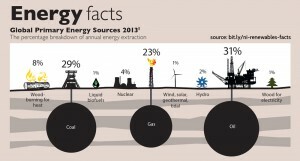 Neither nuclear energy nor most renewable technologies emit carbon dioxide during operation. However, to do a meaningful comparison, we must compare the whole life-cycles from mining the raw materials to managing the wastes. In a peer-reviewed journal paper published in 2008, nuclear physicist and nuclear energy supporter Manfred Lenzen compared life-cycle emissions from nuclear, wind and natural gas power stations. For nuclear energy based on mining high-grade uranium ore, he found average emissions of 60 grams of carbon dioxide per kilowatt-hour (g/kWh) of electricity generation, for wind 10–20 g/kWh and for gas 500–600 g/kWh. Now comes the part that most nuclear proponents try to ignore or misrepresent. The world has only a few decades of high-grade uranium ore reserves left. As the ore-grade inevitably declines, the fossil fuel used to mine and mill uranium increases and so do the resulting greenhouse gas emissions. Lenzen calculates the life-cycle greenhouse gas emissions when low-grade uranium ore is used to be 131 g/kWh. This is unacceptable in terms of climate science, especially taking into account that Lenzen’s analysis favoured nuclear energy by assuming that mountains of radioactive uranium mine waste are left to blow in the wind for thousands of years. Could the proposed new generation of reactor technologies reduce greenhouse gas emissions from the nuclear life-cycle? The so-called Generation IV technologies are the fast breeder reactor, the integral fast reactor, the thorium reactor and the small modular reactor. All are likely to be even more expensive than conventional reactors. Because the fast breeder and integral fast reactors can ‘breed’ more nuclear fuel, in the form of plutonium-239, than they consume, their use could significantly reduce uranium mining and hence the carbon dioxide emissions from mining and milling. But they are even more complex, dangerous, conducive to proliferation and expensive than the conventional nuclear reactor. Despite several decades of pilot and demonstration plants, these technologies have not been successfully commercialised and may never be. Nuclear proponents try to justify the integral fast reactor and the thorium reactor on the fallacious grounds that they cannot be used to produce nuclear weapons explosives. However, if not used according to instructions by governments that control it, the integral fast reactor can actually make it easier to extract weapons-grade plutonium and hence make bombs. Thorium is much more abundant than uranium, but to be useful as a nuclear fuel, thorium has to be converted to uranium-233, which can be fissioned either in a nuclear reactor or a nuclear bomb, as the USA has demonstrated. The small modular reactor (SMR) has been a dream of the nuclear industry for decades, which hopes that mass production could make its electricity cheaper than from existing large reactors. However, offsetting this is the latter’s economy of scale. The Union of Concerned Scientists has serious safety and security concerns about SMRs. Nuclear proponents often publish highly optimistic projections of the future cost of energy from nuclear reactors. However, past and present experience suggests that such projections have little basis in reality. Apart from the ‘new’ reactors mentioned above, which are not commercially available and hence cannot be costed credibly, the much-touted current power reactors under construction (none is operating) are classified as Generation III+. Two Generation III+ reactors are under construction in Europe, two in the USA and several in China. In Finland, Olkiluoto-3 is nearly a decade behind schedule and nearly three times budgeted cost; in France, Flamanville-3 is five years behind schedule and double budgeted cost; in Georgia USA, Vogtie is three years behind schedule. The proposed new Hinkley C in the UK will receive a guaranteed inflation-linked price for electricity over 35 years, commencing at 9.25 p/kWh (about 18 AU c/kWh), double the typical wholesale price of electricity in the UK and over three times Australia’s; it will also receive huge loan guarantees and insurance backed by the British taxpayer. To these costs we must add the huge subsidies to nuclear energy for research and development, uranium enrichment, waste management, decommissioning of power stations, under-insurance, recovery of stranded assets from electricity consumers and loan guarantees. These dwarf the modest, declining subsidies to renewables. On insurance the Japan Center for Economic Research estimated that the partial costs of the Fukushima Daiichi disaster are in the range US$71–250 billion. Yet TEPCO, the operator, was only required to cover US$1.5 billion for liability protection for the costs of a radiation leak – even this pittance excluded earthquake and tsunami. For comparison, wind energy is around 8–10 c/kWh in excellent sites in Australia and about half this at some sites in the USA. SunEdison has contracted to supply electricity from a large solar power station in Chile in 2016 for the record low price of US 9 c/kWh. Both solar and wind are still becoming cheaper as their markets grow. The case to expand the nuclear industry in South Australia and the world is weak. It stands neither on its life-cycle carbon dioxide emissions, nor increased safety, nor economy. New nuclear technologies under construction are far over budget and over time. Future nuclear technologies are not close to being commercially available. These and other nuclear issues are discussed in more detail in Chapter 6 of my book Sustainable Energy Solutions for Climate Change. Uncritical acceptance of the claims of nuclear proponents would set back safer, cleaner, faster and cheaper methods of mitigating climate change. This blog first appeared in NewMatilda. This entry was posted in Activism, Climate change, Economics, Environment, Renewable Energy and tagged activism, climate change, economics, environment, Mark Diesendorf, nuclear energy, reactor, renewable energy, SMR, solar power, sustainability, thorium by Mark Diesendorf. Bookmark the permalink.